Arriving at the first Saturday in April provides another opportunity to participate in the Six Degrees of Separation meme, hosted by Kate over at BooksAreMyFavouriteAndBest. This month we start with Ali Smith’s How To Be Both. I have not yet read this book but I know that its format is unusual with two versions of the same story and the reader can choose where to begin. Another book that has different starting points is Carol Shields’ Happenstance. This is a single story about a marriage which is split into two parts, each told from the husband’s and wife’s perspective. My lovely husband bought this book for me when it was originally published in 1994. Somewhere over the years, with house moves and much sorting of shelves, I sadly managed to loose his copy. So I recently spent time hunting down a good copy of that original edition and am pleased to have it back in my collection. Another book I have recently hunted for in a very particular edition is New Grub Street by George Gissing. My late uncle, Professor John Goode, edited this version and I am looking forward to reading both his introduction and the novel itself. Taking the London setting of New Grub Street as my next link gives me a huge range of options. I am plumping for the last London-based book I read, which is the excellent Transcription by Kate Atkinson. This is a novel about spying and spies, which allows me to link to one of my most favourite spy books – William Boyd’s Restless. I ‘read’ this book in audio format. It was narrated brilliantly by the wonderful Rosamund Pike. So for my next book I am going to take the name Pike and make a fishy link to Salmon Fishing in the Yemen by Paul Torday. This is a light but engaging read about political spin, hypocrisy and bureaucracy. Hmm… sounds sadly rather familiar at the moment. But I am going to swerve smartly away from current affairs and stick with the fishy theme to conclude this month’s chain. Fish Have No Feet by Jón Kalman Stefánsson is an Icelandic novel which I stumbled across recently. Its description sounds rather bleak – it is set in a town surrounded by a sea which can no longer be fished and which is under the influence of a US military base. But something about the reviews and a glance through the first few pages makes me think that this will be a good read. We shall see. Like many bibliophiles, I love chatting with others about books as much as doing the actual reading. 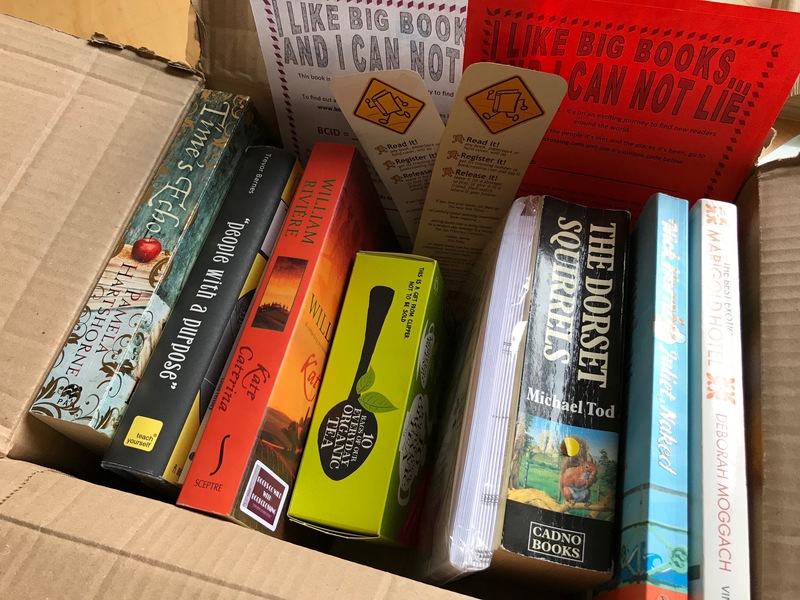 And I was absolutely delighted to discover recently a whole new branch of bookish exchanges – the concept of BookCrossing. I spotted this tweet and could not resist replying to say ‘yes please’! Having been away with work for a few days, imagine my delight on returning today – not only was it great to be back home, but I also had a parcel waiting for me. The lovely Tim had sent me this amazing box of goodies. I have not read any of these books so I can’t wait to dip in. And how amazing also to receive some tea, notecards and bookmarks. It’s the most wonderful surprise! As I understand it, my first task is to update the book crossing website to show that these books are now in my possession. I can then get stuck in with some reading. And then I can release them on to their next lucky recipient, whoever that may be.